Wearing: Others Follow dress, Forever 21 hat, Kohl's cut-out booties, Forever 21 coin necklace, My Name Necklace personalized "Carly" necklace. When I went to Atlanta, my suitcase consisted of band tees, cut-off shorts and boho pieces. This outfit in particular I wore on the way there, because it was comfy, cute and I didn't feel extremely hot wearing it, which was a main goal of mine! The dress is from Others Follow and is from their new fall 2014 collection, and I just love it so much because while the colors and print are very fall, the dress is mostly a sheer material, has thin straps and also still has that floral print going on, so it makes it perfect for transitioning into fall, especially when the fall prints are coming out but the temperatures are still scorching like they are here. 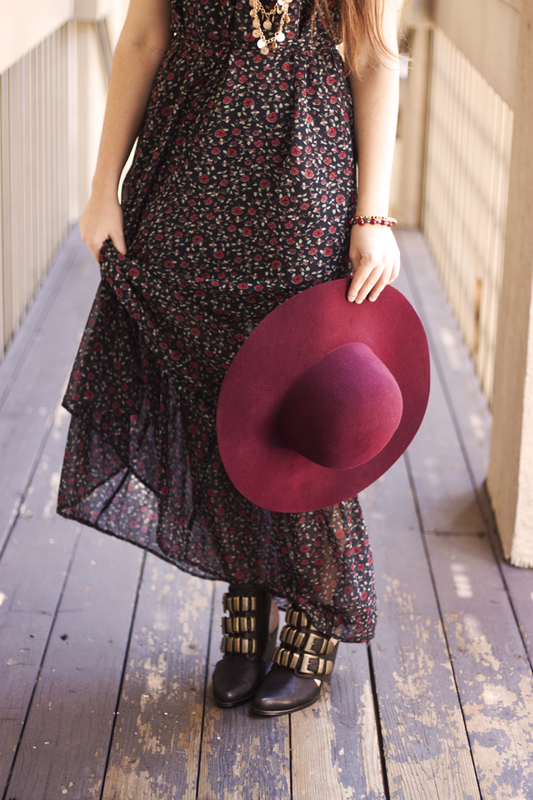 With the dress I wore my cut-out booties from Kohl's, a layered coin necklace from Forever 21 and to bring out the color in the dress, my maroon colored hat from Forever 21. These pictures were actually taken at the hotel I was at also, they were doing a bit of reconstruction on the place which kinda sucked, but that also meant that part of the building looked really rustic and perfect for my pictures! Yay! Such a cute dress. I enjoy wearing cute comfy dresses while traveling too. You look put together but are also comfortable. It's like sneaky comfort!